Various factors affect the performance of electrical contacts, including tribological, mechanical, electrical, and materials aspects. Although these behaviors have been studied for many years, they are not widely used or understood in practice. 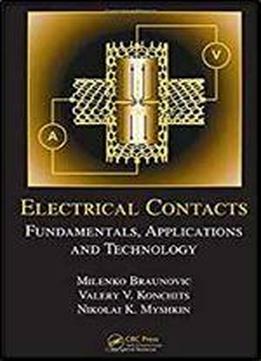 Combining approaches used across the globe, Electrical Contacts: Fundamentals, Applications, and Technology integrates advances in research and development in the tribological, material, and analytical aspects of electrical contacts with new data on electrical current transfer at the micro- and nanoscales. Taking an application-oriented approach, the authors illustrate how material characteristics, tribological behavior, and loading impact the degradation of contacts, formation of intermetallics, and overall reliability and performance. Coverage is divided broadly into three sections, with the first focused on mechanics, tribology, materials, current and heat transfer, and basic reliability issues of electrical contacts. The next section explores applications, such as power connections, electronic connections, and sliding contacts, while the final section presents the diagnostic and monitoring techniques used to investigate and measure phenomena occurring at electrical contact interfaces. Numerous references to current literature reflect the fact that this book is the most comprehensive survey in the field. Explore an impressive collection of data, theory, and practical applications in Electrical Contacts: Fundamentals, Applications, and Technology, a critical tool for anyone investigating or designing electrical equipment with improved performance and reliability in mind.